So you think San Francisco’s epidemic of property crimes — car thefts and break-ins, package thefts, home burglaries, stolen bicycles — is bad now? San Francisco suffers from the highest rate of auto burglaries of any large city in the nation. From 2010 to 2017, it increased by more than 300 percent, from 10,000 to more than 31,000, though it tapered off somewhat in the last few months. Property crimes in general increased by 35 percent in six years in San Francisco, while decreasing statewide and in neighboring counties. But it may get worse. This fall, four criminal defense attorneys who regularly represent these burglars (and other suspected criminals) in court are engaged in a concerted campaign to take over San Francisco courts. Our local court system, already notoriously “soft” on property crime, isn’t good enough for them. Instead, they want to “change our justice system from the inside out,” and not for the better if you are a potential victim. Potentially adding to the problem, California’s centuries-old system of bail that keeps some criminal suspects in jail may soon end in any meaningful sense, under pressure from the courts and the legislature. While equal justice under the law is vital, eliminating bail could also impact property crime rates. This story will attract much media attention as policy changes over the coming months, so let’s examine the electoral coup-de-court before us in the here-and-now. While the leaders of this attempted coup d'état are deputy public defenders Maria Evangelista, Kwixuan Maloof, Niki Solis and Phoenix Streets, it may be argued that the chief coup plotter is Public Defender Jeff Adachi, their current boss. (Adachi endorses their campaign, but says it wasn’t his idea.) While he failed in his attempt to take over City Hall as mayor in 2011, this grab to take over the courts threatens to be even more far-reaching. Candidate Kwixuan Maloof, for example, doesn’t believe most convicted criminals should go to prison, because it should be a last resort. You can imagine that property criminals would receive only a slap on the hand from him. As a judge, he would “focus on rehabilitation.” A former youth social worker, Kwixuan “has dedicated his life to helping youth and families get back on track” according to his campaign brochure. That’s great for a social worker and a useful volunteer avocation for anyone. But shouldn’t a judge be concerned about public safety? In the case of serial, multiple offenders, surely there comes a time where crime demands loss of freedom for the offender, and rehabilitation can and must take place in our excellent jails and prisons. (Incidentally, there is robust evidence that San Francisco jails are excellent and do provide ample rehabilitation opportunities. So why is the crime rate so high despite rehabilitation? For starters, many of the criminals come from out-of-town gangs, and perverse incentives to recruit youth into a life of crime provide an endless supply of criminals. And judicial leniency may be a contributing factor here). In the same vein, fellow candidate Maria Evangelista says “I want to stop crime.” She also claims to be “known for her work to stop repeat crimes and recidivism.” Yeah, right! The public rightly believes that criminal defense attorneys seek to use the legal process to win release for their burglary and violent crime clients. Voters should demand she provide evidence to support her assertions, because that sounds like campaign propaganda. Gov. Brown has already appointed four (of seventeen) public defenders as judges in San Francisco, and several other sitting judges are former public defenders. Sure, there are undoubtedly good judges who are former defense attorneys, but the vast majority received an appointment after demonstrating they were well-qualified and showed judicial temperament. Candidates who insult their incumbent judge opponents and play blatant politics don’t look quite so qualified. Criminal burglary gangs from around the Bay Area already flock to San Francisco because they know that if caught, San Francisco courts will more likely divert them into “rehab” programs rather than send them to jail as in other counties. Readers may have heard about the car burglar who lamented on a local TV news show about making a “mistake” resulting in an arrest in Daly City. Working streets along San Francisco’s southern border, he’d accidentally strayed into San Mateo County where he was caught by police and faced a term in prison, when he would have been able to continue his life of crime if he’d burglarized just a block further north. Long story short, in the June 5 election, I urge you to re-elect Judges Curtis Karnow, Cynthia Ming-mei Lee, Andrew Cheng and Jeffrey Ross if you don’t want to see more property crimes. But the truth is, more crime may result from Adachi’s power grab regardless of who wins or loses. The very act of running four public defenders may push San Francisco judges to become even more lenient in their treatment of burglars, lest they be subject to political attacks. The campaign for the four incumbents has stressed their progressive credentials, including how two of them have diverted criminals from jail through so-called “collaborative courts.” Judges who want to keep their jobs in the future may find that putting more repeat criminals back on the streets is the safer play. When was the last time a judge was challenged via election in San Francisco for being soft on property crime? 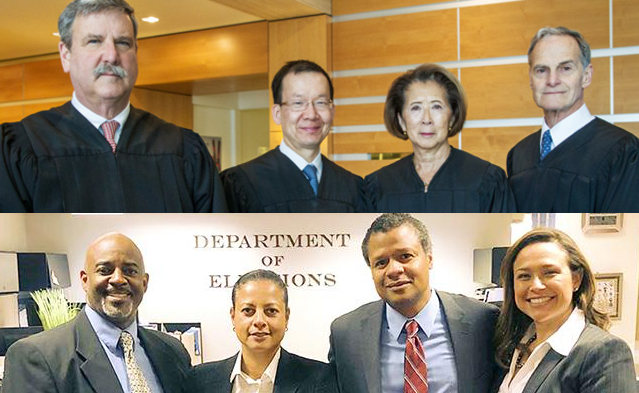 Re-electing Judges Karnow, Lee, Cheng and Ross is no panacea. Still, it’s likely better than the alternative. Frank Noto is the president of Stop Crime SF. The views in this blog post are his own, as a resident of San Francisco.